Sales Success Program | Mark Bowser | Superior Training, Superior Results! 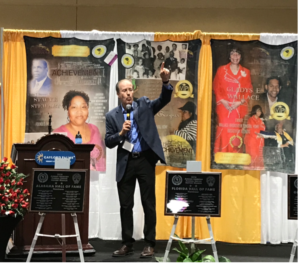 For information on how you can bring The Sales Success Program on site to your location…personally presented by me, Mark Bowser, ….then contact me at mbowser@MarkBowser.com or call (513)252-GOAL! Book Your Half-Day or Full-Day Program Today…I can only accept so many speaking days in my calendar…so make sure you reserve yours now! With The Sales Success Program, Your Sales Team Will Learn the Best Techniques Used By the Best of All Time! *An excerpt from the book “Sales Success” which the program is based on. As Jack left his manager’s office, he felt lost. He had no clue on how to improve. He had no clue on where to even start. “It wouldn’t make any difference anyway,” thought Jack. Do you have anyone on your sales team similar to Jack Blake? Have you ever felt like Jack Blake? I know I have. You are trying as hard as you can, but you just can’t seem to shake the shackles that are holding your sales career down. It wasn’t supposed to be this way, was it? You entered the world of selling with excitement and joy. The world was your oyster and you were ready to grab it with both hands…but, somehow your hands keep slipping off the oyster. But, is there a way you can live what the headline of this letter suggests? How would your life change if your team doubled their sales? How would that success change the individual lives of your team members? But, can your team actually double their sales by attending a Sales Success Program? YES, if they take action on what they learn…then YES your team could double, maybe even triple their sales. Jack only lived about 2 miles from the zoo. In fact, Jack has lived in the Cincy area all his life. He grew up in the beautiful Cincinnati suburb of Loveland, OH. As Jack entered the zoo entrance gates, he could already feel a bit of the stress leave his body. He walked passed the entrance and headed to his favorite spot, the Gorilla exhibit. He loved the Gorillas. They are so majestic with such strength but also such poise as they climb up the trees and other elements in their zoo home. Everything Jack wasn’t and wanted to be. Jack moved to the series of benches directly in the middle of the exhibit and took a seat. It felt good to sit down. He hadn’t realized how exhausted he was. For a moment, Jack closed his eyes and let the thoughts and stress ease from his weary presence. Jack shook off the cobwebs in his mind and remembered his manners. Jack gestured to the open seat next to him on the bench and said, “Ah, no. Please.” Before Jack could get the words out, the old man sat down right next to him. “So, what brings you to Sam’s house today?” asked Digger. Jack sighed and reluctantly said, “Oh, I am having some trouble at work.” Why was he opening up to this man? Who is this guy? “How did, hhhow did you know? How did you even know that I am in sales?”stammered a now very freaked out Jack. Who sent him? My boss? Mrs. Norris? Jack’s inner thoughts were bombarding him with more questions…but no answers. No, his boss didn’t really care and Mrs. Norris didn’t know he was at the zoo. And besides, how would she ever know a guy like this? “Who sent you?” Jack finally asked Digger. A small smile formed on the corners of Diggers mouth. “Don’t worry about that. Just know that I am here to help…and I can help you Jack. Tell you what, meet me tomorrow morning at 7:45 AM at this address.” Digger handed Jack a shredded, wrinkled up scrap of paper with an address scrolled on it. “The Cincinnati Chamber of Commerce is hosting an event. There is someone I want you to meet. Just be there at 7:45 and a ticket will be waiting for you. I will see you tomorrow.” With that, the old man got up, smiled, and made his way out of the Gorilla exhibit. Weird huh? A mysterious mentor showed up to help a struggling salesperson. Well, your mentor probably won’t show up to you like my character Jack in Sales Success but, my friend, we all need mentors and so does the members of your sales team. Let me be that mentor for your team to success in your selling careers. So, what is the answer to the question on how you can shorten your sales cycle and close more sales? Well, that is the question that sales managers, sales trainers, and sales reps have been trying to answer for decades. And, at the risk of sounding cliché – I’ve found it! And, to tell you the truth you already know the answer too. The answer is in knowledge which is found in seminars and books. Listen! Just hear me out for a moment – then you can throw this letter out if what I say doesn’t make sense. We all know the answer is in training knowledge that is found in seminars and books. A plethora of books have been written for decades. And, you could attend a seminar every day if you wanted to. The challenge is time. Who has time to read every sales book and attend every sales seminar? If we did that, we wouldn’t have time to go out and sell. Right? Oh, I know the answer! We read books and attend seminars every evening and every weekend…But, there comes that time thing again. In this day and age we are all so busy. We have our work schedule of course, but then we also have our personal schedule. We have our children’s functions to go to, tickets to the movies, and for many basketball fans like me – there is always a game to watch. Of course, Indiana University games are the only ones that matter. Ha. Ha. Your Challenge is Time. You Don’t Have Time To Read All Those Books and attend all those Training Programs To Gain The Information You Need to Double Your Sales. to doubling your sales? Does that sales program exist? This is the one sales program you must attend — that is if you want to double your sales. Why Creating Value First is Vital…And How to Do It! • How To Become More Persuasive…and Sell More! Reserve Your On Site Sales Success Program NOW! “Great Read! First of all, you can’t argue with the “A-list” contributing to this book. It reads well, is laid out nicely, and is easy to pick back up on during my hectic schedule interruptions. As a dentist, I am not a “salesperson” and I do not force or try to talk patients into treatment. However, creating trust and value for a product or service correlates to ANY profession. Learning how to create that value, present the issue/items, and communicate is key….This book helped me see views from a patient (i.e. non-dentist) perspective and the coaching from this rock-star team of contributors is spot-on. 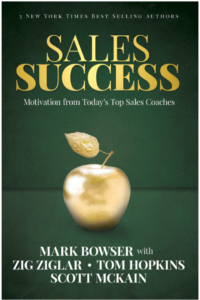 “Mark Bowser’s “Sales Success: Motivation From Today’s Top Sales Coaches” was a fun, interesting and informative read. It covers the basics of the selling process, or more accurately, what it takes to succeed in sales, very well. Because I’m a sales professional I read one to two sales books a month. They range from very boring, dry and hard to read to those few that engage, inform and educate. Sales Success leans heavily to the latter, intertwining snippets from various sales trainers, some well known like Zig Ziglar, Tom Hopkins and Tony Alessandra, some not so well known (at least by me) within a simple narrative that serves to move the story along and tie everything together. If you are new to sales this could serve as your only resource and you would do well executing what it teaches…positive mindset, a proper and well thought out sales process, understanding the customer, establishing rapport, learning to close and keeping the long-term in mind. 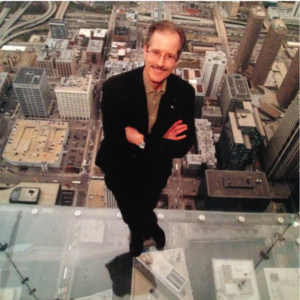 “I have been in sales for 20 years so as you can imagine I have read a lot of sales books. This book was by far my favorite! I normally approach a sales book as required reading but I found myself looking forward to each chapter! Mr. Bowser expertly weaves great sales tips and best practices into a fictional story about a salesperson who, in the beginning of the book is down on his luck and struggling with his sales. As the story progresses the main character learns a better way to be successful. I know what you are thinking. What is the price of bringing Mark Bowser onsite to work with my team? You are going to be pleasantly surprised. Are you ready? To have me for a full day to present the Sales Success Program for your team is only $8,000 plus expenses. That is it! But, you need to HURRY! As you can imagine, I can only accept so many speaking days in my calendar…particularly at that fee. So, you had better reserve your Sales Success Program today! What would your income be if you doubled your sales? What about if your whole team doubled their sales? What increase would that bring to your company’s bottom line? To receive that kind of income, isn’t it worth investing in yourself and team today? Schedule Your Sales Success Program Today! Have a great day. See you soon! God bless.